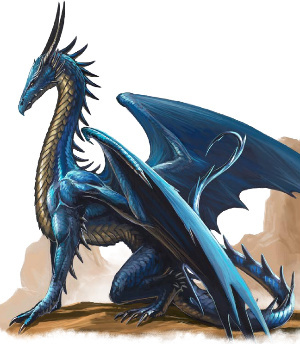 The blue dragon, or Utreshimon as he is known to his kin, wished to turn the Moathouse into his personal lair. However, pesky robed gnats and their barbaric servants stood between him and his goal. He devoured only two of them and the rest fled into the dungeons, the hallways too narrow for him to follow. Utreshimon was not concerned - the humans would either exit to acquire provisions or starve - so he perched atop the stone tower and waited. Several days later, another group of pygmies walked in through the front gates. He engaged them without hesitation, but they proved to be far more skilled than he and the blue dragon was struck down by a mage's burst of fire as he tried to retreat. It was only after his defeat that Spugnoir could safely traverse the ground level of the Moathouse to return to Hommlet.